Lian Husi Klamar Sounds of the Soul » Tekee Media Inc. The publication in Tetun and English of the book Lian Husi Klamar: Musika Tradisional Husi Timor-Leste (Sounds of the Soul: The Traditional Music of East Timor) was a culmination of ten years research which became known as “The Music Recovery Project : Tekee Tokee Tomak”. 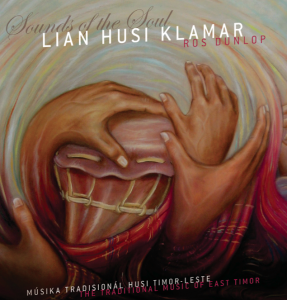 The book Lian Husi Klamar, or Sounds of the Soul was made possible through a rich collaboration of musical and visual artists from East Timor, and supported by a grant from the United States Ambassadors’ fund For Cultural Preservation. Author and musician Ros Dunlop made her first trip to Timor-Leste in April 2002 with Timor activist brothers Robert and Martin Wesley-Smith. Ros and Martin gave concerts of Martin’s audiovisual pieces about East Timor. They were enchanted by Timor-Leste’s land, people and culture – especially it’s traditional music. Wanting to give something in return, Ros began visiting Timor-Leste regularly to record this special music. To do this, she needed the help of many Timorese citizens. The skilled musicians who were acutely aware of the importance of recording their music for posterity and the translators and assistants who helped to organise the recording sessions. These artists from Arte Moris Art School and the young Timorese from the audiovisual archive, Centro Archivo Max Stahl Timor-Leste understood the importance of a permanent record being made. Without their help this project would not have happened. To order multiple copies contact rosdunlop@tekeemedia.com.